Instant Messenger Bot BuilderInteractive Promotion Application for Brand Marketing The exclusive certified develop platform of Windows Live Messenger (MSN) bot. Interactive Promotions for Brand Marketing by BotPlatform Instant Messenger Bot Builder. 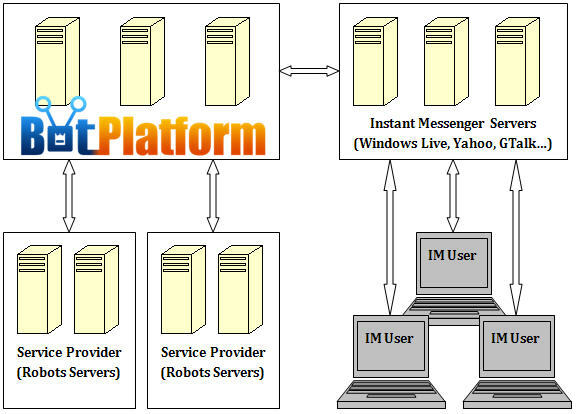 BotPlatform is the exclusive certified platform of Windows Live Messenger (MSN) bot, coming to support Yahoo! Messenger, and other IM services, with more than 70,000 individual developers all over the world. The SDK is easy to distribute, develop, debug and deploy. Developers can devote your energies to the robot itself, without taking care of the complex communication protocols. SDK uses I/O Completion Ports for COM network communication, thread pool for COM / JAVA thread mechanism, so developers only need to focus on implement of service logic. Easy to use, with complicated communication protocol encapsulated. Easy to distribute (Development Kit with documentation has only hundreds of KB), Favorite developing languages and environments for developing and debugging, with clear function interface. Easy to deploy, run independently. Robots could not only initiate conversation, but also actively get IM users information, resources and most of activities. So that developers can make much more application about users. The SDK is open source and open protocol. So based on this platform, you could create and release your own Messenger robots with your favorite developing languages and environments, such as JAVA, C#, C++, BCB, VB and so on.